Knifey's been taking it easy recently. The differing time-zones make teaming up with the rest of my party difficult and, after learning the lesson the hard way before, I don't want to get ahead of my friends so that we can't team up. There is also a certain ennui settling over me when playing solo, and with over 3,000 gold in the bank World of Auctioncraft isn't as necessary or fulfilling any more. So despite the levels flying past whenever playing, with everyone in the group gaining a level from running a handful of quests in the Western Plaguelands in about ninety minutes for example, there has not been too much advancement overall. 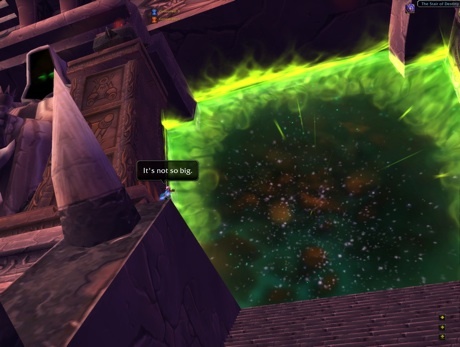 But that level gained in the Western Plaguelands got me to 57, and that's just one level away from being able to pass through the Blasted Lands' Dark Portal to the Outlands. I set myself the small target of reaching level 58, so that I could pop my head in to the Outlands and visit the Master profession trainers. This didn't take me too long to achieve with the large number of quests available in both the Plaguelands and Burning Steppes, without even needing to head to Winterspring or Silithus. I'm quite glad, to be honest. After I gained the significant 58th level and Knifey took his first steps in to the Outlands I was reminded of how big, full, and interesting the Outlands still is. I've spent too long in Azeroth, time I've already spent there in the past, and the new world opened before me may well be the reinvigorating push I need to get past this ennui and feel more excited about exploration and questing again. It shouldn't take long for the others to get to 58 and then the opportunities to explore Hellfire Citadel open up. When that happens the World of Warcraft can feel like a place of adventure again and not somewhere to pass the time. There was another reason I made myself the goal of reaching level 58 ahead of time. My recollection was that the green drops from Outlands required at least level 58 before characters could equip the items, and that, for reasons I don't entirely agree with, are vastly more powerful than items found in Azeroth. I checked the auction house often, separate from my profiteering, for swords and dagger just out of my reach. Sure enough, there were some being offered for sale that were from the Outlands and having outrageous DPS values for their level, although I was wrong that they started becoming available at level 58, as some were showing up for my current level of 57. I bought a level 57-required dagger to use immediately and found a level 58-required sword for the next level, both green quality, for around 20 gold for the pair. I swapped out my old weapons, both bind-on-pickup blue quality weapons dropped by boss mobs in dungeons, and only a couple of DPS below what I could reasonably get for my level. The old weapons were both giving about 35 DPS. The new weapons from the Outlands were both rated at 45 DPS. Maybe the stats on the new weapons weren't optimal for a rogue, but I didn't care. A boost of 10 DPS on the base damage of a weapon is an enormous boost to damage output, almost 30% more, and superior to anything I could find in Azeroth without killing a boss that requires a raid to defeat. This is the real reason why I aimed to reach 58 sooner rather than later, because now I am a killing machine that inhabitants of Azeroth can only fear. This entry was posted on 6th May 2008 at 1.49 pm	and is filed under World of Warcraft. You can follow any responses to this entry through the RSS 2.0 feed. Both comments and pings are currently closed.